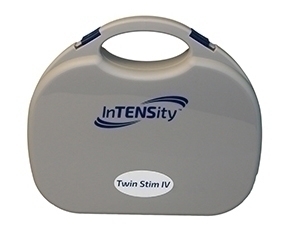 The InTENSity" Twin Stim III is a portable electrotherapy device featuring two therapeutic modes: TENS and EMS therapy, which are used for pain relief and electrical stimulation. When operating in TENS mode, the unit has four modes and when operating in EMS mode, three modes. An industry leader at 105 mA, this device comes standard with an AC adaptor. Simple-to-operate, portable electrotherapy device for pain management. 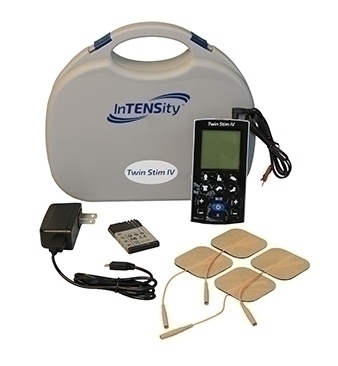 Unit combines TENS and EMS therapy for optimal treatment. Four modes for TENS therapy: Burst, Normal, Mod 1 and Mod 2. Three modes for EMS therapy: Synchronous, Asynchronous and Delay. Comes complete with carrying case, two sets of lead wires, 9-volt battery, AC adaptor, manual and pack of four self-adhesive reusable electrodes. Power Source: Standard 9-volt battery or AC adaptor.